a worldwide treasure hunt every time you went? Welcome to the community activity that is geocaching. 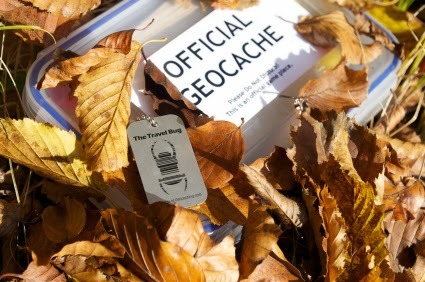 Although it’s been around for a while now the idea of Geocaching is only really well known to the people who take part. But it is brilliant, great fun and a fantastic dog friendly activity. Even the kids love it. A walk with a difference and much like the ancient activity of letterboxing, where participants look for a box or tin that could have been hidden for decades, or even longer. With letterboxing some of the oldest caches are written in books and have been around a lot longer than any electronic mapping system. That’s the difference with a Geocache. To find it you use a GPS system. Participants of the Geocaching world spend their time in the activity looking for a cache. The cache is a mixture of items stored in a waterproof container which can be anything from an old ammo box to a Tupperware. The only necessity is that the container is hardy and weatherproof. Inside the box is a selection of items including a notebook, stamp and a mixture of little items that previous finders have left and swapped into the hide. Caches also often hold items that can be taken or moved from cache to cache. The rule is that if you take a cache item away then you must replace it with something of equal or higher value. One of the greatest things about the activity is that it is based in trust. Geocaching is a worldwide activity. All cache movement is recorded online alongside the adventures of participants and the location of caches. The more imaginative ones can be up trees or underground. We can tell you that it’s pretty exciting to find one. Be prepared though for your dogs to think you have gone crazy. Where normally you would walk in a straight line with Geocaching you go backwards and forwards, fiddle in bushes, pull loose bricks from walls and stand, silent, staring at trees looking for the hidden obvious. This process is usually followed by an enthusiastic victory cry, the swap of a trinket, a signature in a tiny book and a keen yomp to the next place – where you do it all over again. Participants carry out their hunt with the use of a hand held GPS system or smartphone. A cheap GPS system can be bought online, if you feel like having a go, and by joining the official website you can learn everything you need to know and pick up all the information that you may need. In the UK alone there are over 70, 000 caches just waiting for their next finder. So by going along to Geocaching.com and joining the site you can gather co-ordinates on a local cache, enter them into your GPS system, have a quick look at other people experiences with this particular cache and when it was last found then simply hook up your dog, lace up your boots and go Geocaching. You may be surprised how close your nearest cache is. If you have a go at Geocaching we would be surprised if you don’t continue with it. You will find areas around you that you had no idea existed. You will bump into people who are hanging around plotted areas, trying to look discreet and you will revisit the excitement of any childhood treasure hunt. Then after your trip, with a happy and tired dog, you can go home and record your experience online. Now that’s what we call a great day out.